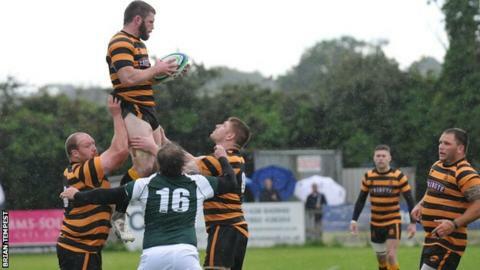 Graham Dawe claimed his Cornwall side caught Gloucestershire "on the hop" in their 27-8 County Championship win. Winger Robin Wedlake scored two tries, with Jake Murphy and Matt Shepherd also going over the whitewash at Cinderford. "We may have caught Gloucestershire a little bit on the hop," the Cornwall coach told BBC Radio Cornwall. "Robin Wedlake and Billy Searle were outstanding. Searle looked like a real pro, he didn't get flustered and I'm really pleased with his kick game." Cornwall are looking to reach the Twickenham final for the third year in a row and visit Kent in their next game in the group. In the last two years, Cornwall have missed out on lifting the trophy by losing to Lancashire, who have dominated the competition. "We've been together all through the winter, so you get a bit of trust and respect from one another to turn up on a cold, wet, windy night (to train)," added Dawe. "It's a shackle-free environment. There's no money involved, there's just wanting to play with a bunch of brothers. "If you don't buy into that team ethos and camaraderie you're not in the squad, you fall by the wayside. "Cornwall is a proud county at whatever level of rugby you play and long may that shirt be worn with a lot of pride." The county's final game is at home to Hertfordshire as they attempt to reach the latter stages. Backs coach Ian Morgan has said he is quietly confident of a strong County Championship campaign.